Share the post "Retention rate"
Perhaps the most important aspect e-commerce analytics is retention rate (retention of users). After all, if users used your service once and never again after in most cases the service is going to fail. 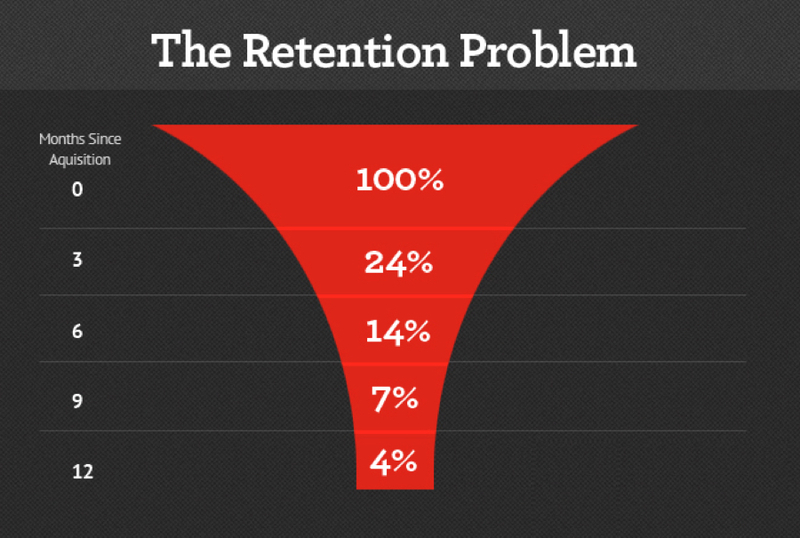 Let’s start with how to calculate the retention rate. There are several ways. The easiest is to divide the remaining number of members to the number of all users who joined your service. For example, 100 unique users visited your website per day. Of these one hundred people, ten returned to the website. So, the retention rate is 0.1, or 10%. Typically, this indicator is calculated for the first day, seventh, fourteenth, twenty-eighth, etc. For example, on day 0 hundred people visited the website and only 10 came back in the end of the month. Retention on day 28 is 10%. This is called the classic retention. Of course, the more days have passed from the day 0, the lower the retention rate. Events. Promotions, bonuses, sales, tournaments, etc. Users should be aware that the frequent visits of the website will give him some prospects or benefits. Gifts for the return. Game currency, options, etc. Tasks. Daily missions, quests, puzzles, etc. Characters and plot. People become attached to specific characters and watch the development of the plot/story. Progress. Number of victories, medals, crystal, experience points, awards, status, results. New faces. The more the user on the website, the more it opens up new opportunities, levels, mechanic, worlds, etc. Remember that to attract a user is much easier than to retain him and to retain him is much cheaper than to attract a new one. This rule is working in any e-commerce and the money spent on retention of the customers have to be taken into account while calculating the LTV. Of course the high retention rate does not come for free, however to retain a user is much cheaper than to attract a new one. In the article I have mentioned the tips how to engage the users to increase the retention rate so that users could come back more often to the service/website. As I have already mentioned in most cases the retention rate increase comes at expenses which are quite necessary if you want the customers to com back. Let’s assume that some Cool Polish University spent PLN 4000 on attraction of new students to some Cool Master Degree Program. The program is funded by EU (meaning it is free and student are not paying for the program). The only payment that students have to pay is exam fail-fee which is PLN 610, which is the only income to the University from the admitted student. Let’s imagine that in the beginning of third semester the students of this program started to complain that they want to have seminars on Google AdWords and Google Analytics otherwise they are going to leave the program and the University decides to organize such seminars. The seminar on Google AdWords and Google Analytics costs PLN 2100 and for the Cool Polish University it is a “retention event” (meaning that people are going to leave the program if they will not have these seminars). For the Cool Polish University these PLN 2010 are additional “retention costs” which are not foreseen by the EU funding. Now the question: How many students have to fail the exams in 3rd semester to have Google AdWords and Google Analytics seminar in the beginning of 4th semester? Names, places and incidents either are products of the author’s imagination or are used fictitiously. What is the average retention for e-shop?